This distribution agreement is for any business selling goods of any type at home or abroad. The arrangements you make are comparatively free of regulation. You can make the deal you want. 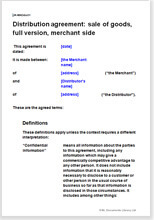 This distributor agreement has been drawn to provide an armoury of ideas in plain English. You can be tough or tender. Whether you are the distributor or the merchant, there will be many areas where you would like the other of you to do things your way. As a result there will be a lot to negotiate. By setting everything down in a document like this before you start to talk, you have a head start. The agenda is yours. This is a very comprehensive document, but as always with Net Lawman documents, you can reduce it easily to the exact terms you need.